Note that some funds that started 5 years ago probably got canned due to poor results (or other reasons) and are thus excluded from the “100 or so equity funds” that Carrick mentions. See Survivorship Bias. But even if markets were not efficient, indexing would still be a very useful investment strategy. Since all the stocks in the market must be owned by someone, it follows that all the investors in the market will earn, on average, the market return. The index fund achieves the market return with minimal expenses. The average actively managed fund incurs an expense ratio of about 1.5 percent per year [ed: in Canada I think this is higher]. Thus the average actively managed fund must underperform the market as a whole by the amount of the expenses that are deducted from the gross return achieved. Again survivorship bias plays a role here. If we included some of the funds that existed in 1974 but did not make it to 2006, the S&P 500 would most likely have outperformed an even larger fraction of the public equity mutual funds from 1974 to 2006. The Canadian Capitalist mentioned today how he substituted EFA for VEA, a new ETF from Vanguard. The Vanguard Europe Pacific ETF (VEA) is almost identical to iShares’ EFA, which follows the MSCI EAFE index. This is so cool, and its MER is 0.20% less. Not a huge deal, but hey, why not go for VEA over EFA. Looks like Vanguard has the complete offering of ETFs now. I’m currently in XIN, the Canadian-dollar traded version of EFA. I was thinking of switching to EFA the next time I plan on making a purchase of XIN/EFA (which will probably in 3-6 months time), so I’ll probably go with VEA instead. The bulk of my portfolio will be made up of VEA and VTI, along with XIC, VWO, XRB, and XSB. (Probably phasing in some XRE later too). High cost – Too many mutual funds with high MERs. I checked all of these funds’ performance again and for the most part they didn’t seem to be capable of beating their benchmarks in the past. The Growth Opportunities has not beaten the S&P/TSX Venture Composite Index in the range I looked at. CI Value Trust (clone of Legg Mason Value Trust) has not been impressive of late, but even worse, it has assumed far more risk than an index, with its investments in Google and other high-tech stocks. The Templeton International Index fund (last time I checked) had not beaten the MSCI EAFE index over the long term. Also, the TD Canadian Bond fund is not all that spectacular compared to ETFs like XSB. No emerging markets – I wanted some emerging markets to provide increased diversification and greater risk-adjusted return due to their low correlation with other markets. The fact that emerging markets have done very well of late is of no concern to me, I realize if I buy emerging markets equities now I might suffer a bit in the near future. No real return bonds, or inflation-sensitive assets – I looked at the Ontario Teacher’s Pension Plan and the CPP Investment Board and both have significant real return bond holdings. The former has 11.1% and the latter has 3.5% in real return bonds. Huge domestic bias – Although I had originally wanted 25% in Canadian equities my advisor had me at 40% because he had concerns about the US dollar, so we weighted Canadian equities more. This is way too much allocated to a handful of Canadian companies that make up a large part of the TSX/S&P 60 Index. No foreign currency exposure – Foreign currency exposure can be a good thing. If inflation is high in Canada, our dollar will decrease in value relative to other currencies. More importantly, some of my investments, such as the CI Value Trust were hedged versions of USD mutual funds so I was paying extra management expense when I could have just owned the USD version and possibly reduced my total risk at lower cost. Lack of US exposure – I only had something like 11% of my assets in US equities. This is extremely underweight for such a large market like the US. My advisor was planning to “ease in” to US equities (he had some issue with the falling US dollar) but I would prefer to just go with some desired allocation and re-balance when necessary rather than thinking one can be smarter than the market. Now I’ll expand on some of the reasons why I chose the above asset allocation as well as the reasons why I chose each investment in my new portfolio. This portfolio is inspired primarily by Martin Gale, Canadian Capitalist, Dan Solin (author of The Smartest Investment Book You’ll Ever Read), and Burton Malkiel (only part way through his book right now). NOTE: I am under 30, I am looking for long term growth only, I am not planning to take out any of this money until I retire at age 55-65, and I can handle some short-term swings in the market. Using ETFs instead of mutual funds was a no-brainer for me. I have come to the realization that beating the market is virtually impossible for all but a few very talented people, and that passive investing can yield greater returns with less risk due to its lower costs. For more information, read my recent blog post “Malkiel, Bogle Argue Against Non-Market Capitalization Weighted ETFs” or read “A Random Walk Down Wall Street.” I can also give credit to the Canadian Capitalist and his blog for convincing me of this fact. He has been tracking a “sleepy portfolio” for a while now, consisting of a few ETFs and it seems to do pretty well. Many investors make the mistake of thinking that the least risky portfolio is one containing just cash and short-term bonds; or that the most aggressive portfolio is one containing only equities. Somewhat surprisingly, that is false. The safest portfolio contains a mix of stocks and bonds, as does the most aggressive. For any portfolio containing all bonds there is a less risky portfolio with a better return that contains some stocks. This is counter-intuitive because in and of themselves bonds are safer than stocks. I saw some similar arguments in a Powerpoint presentation from an investment advisor recently, that basically said, no matter how risky you want to be, at least hold some bonds (like at least 10%). It is pretty widely accepted that you should have some bonds and some equities. How much of each is up to you. I followed Martin Gale’s advice on short vs long term bonds, and decided to stick to buying short-term bonds, because “whatever risk/return ratio you achieved by buying longer duration bonds, you could achieve by holding fewer bonds and more equities. In general I think the equities have the better risk/return ratio. That could always change–but at least historically, it’s been the case that equities have been a better investment than long-term bonds.” This backs up what I was told by my ex-advisor at Clearsight; stick with short duration bonds and avoid long duration bonds. So, to minimize cost I see only two options. Buying iShares Short-term Bond Index Fund (XSB), or buying individual bonds and making my own bond ladder. I decided to buy XSB since the commission costs of making my own bond ladder would be prohibitive at this point, although when my nest egg is larger this might be more cost-effective because it would eliminate the MER. As I said above, one of the disadvantages of my old portfolio was that I had no real-return bond component. Real return bonds are resistant to inflation because the interest is set to be x number of points above the inflation rate. I looked at the Ontario Teacher’s Pension Plan and the CPP Investment Board and both have significant real return bond holdings. The former has 11.1% and the latter has 3.5% in real return bonds. I decided to have 1/4 of my bond portfolio invested in real-return bonds which amounts to 5%. I might re-evalute this allocation later (in about 5 years). Now that the foreign content limits are removed we are starting to see more and more people suggesting that Canadians hold somewhere around 3-10% Canadian equities in their equity portfolio, rather than the insane 25-70% allocations we used to see. At the Canadian Capitalist, Dan Solin comments on why investors should have no more than 10% Canadian equities in the equity portion of their portfolio. There is also a good article by Martin Gale here about domestic bias and foreign asset allocation. Finally, according to Carl Spiess at Scotia Macleod, “over the last 20 years, international markets have outperformed Canadian markets by almost 2% a year.” We have had some excellent years in the Canadian equities markets recently as well as in the late 1990s thanks to Nortel so people often forget that Canadian equities have historically underperformed against international markets. If you looked at the risk-adjusted return, the picture would probably be even worse. He continues, “it makes sense to invest globally not only based on historical returns, but also because many economic sectors (eg. Healthcare) are not significantly represented in Canadian markets. In addition, despite several good years recently, Canada only represents 3% of world stock markets.” He’s right; The Vanguard Total Stock Market Index has 12% in healthcare, for example, while the TSX Composite contains less than 1% in healthcare as it is dominated by financials and energy. I relied heavily on Martin Gale’s advice on his Efficient Market Canada website. Specifically, his “Building A Globally Efficient Index ETF Portfolio (updated)” article (and it’s predecessor) and also “Foreign Asset Allocation in your RRSP.” I ended up making US Equities 40% of the equity portion of my portfolio, which corresponds to 32% of my total portfolio. The obvious choice here was some sort of S&P 500 Index, like XSP or SPY, but instead I went with the lowest-cost option out there, which is probably the Vanguard Total Stock Market Fund (VTI). It is even more diverse than the S&P 500 in that it currently holds 3692 different stocks. The US market is huge and this is a great way to own it all without having to purchase both the S&P 500 Index ETF (SPY) and the S&P Mid-Cap Index ETF (MDY) for example. Again, as above, I looked at the global market capitalization and decided to put 50% of the equity portion of my portfolio into international stocks. This corresponds to 40% of my overall portfolio. Since Vanguard does not really have much for international index ETFs, and the iShares $USD MSCI EAFE Index ETF (EFA) has the same cost as the iShares $CAD MSCI EAFE Index ETF (XIN), the best option was to go with XIN (see “Exchange Traded Funds: Recommendations“). I was worried that with my much lower Canadian equity component that I would end up having a lot of US dollar investments in my RRSP. As I mentioned above, since Vanguard does not really have much for international index ETFs, and the iShares $USD MSCI EAFE Index ETF (EFA) has the same cost as the iShares $CAD MSCI EAFE Index ETF (XIN), the best option was to go with XIN, which is traded in Canadian dollars. So now my only USD holdings are the Vanguard Emerging Markets Fund (VWO) and the Vanguard Total Stock Market (VTI) which take up about 37% of my total portfolio. Having less than 50% of my RRSP assets in USD seems alright to me. When I get older and closer to retirement I could move more of my money into CAD investments if I feel the need. There are two emerging markets funds to choose from, the iShares one (EEM) and the Vanguard one (VWO). After much searching on Google for “EEM vs. VMO” and reading many articles I could not discern much difference between the two. The Vanguard one uses a slightly difference underlying index as I discussed in my previous blog post entitled “Foreign Exchange Costs Associated With USD Investments in an RRSP” and, like most Vanguard funds, has a much lower cost than its competitors. So I went with the Vanguard fund. Because of the high risk associated with emerging markets and because of their recent stellar performance, I put only 5% of my total portfolio in emerging markets, even though emerging markets make up about 9% of the world market capitalization. I may increase my desired allocation of emerging markets later, relative to my other international holdings. REITs are a good addition to the fixed-income portion of a portfolio and they provide good negative correlation with other asset classes. Most of the large pensions funds hold a significant amount of REITs. XRE is the iShares offering and I will probably be adding this in eventually. I don’t want to do too many things at once. I need to decide if I should reduce my bond allocation from 20% and add in the REITs or if I should reduce my equities from 80% and add in REITs. Or lower both? My original thought had been to have 20% bonds, 5% REITs, which is why I went with 20% bonds rather than 25% bonds as I had before. Please let me know if you have any comments and I will add any details to this article that I may have left out. market, in principle, must be a zero-sum game. But only before the deduction of investment management costs. In practice, investors as a group will fail to earn the market return after these costs, and as a group, they will fall far short of the low-expense index funds. For the typical actively managed equity mutual fund, annual operating expense ratios are well over 100 basis points (one percentage point). Add in the hidden costs of portfolio turnover and sales loads, where applicable, and effective annual costs are undoubtedly considerably higher, perhaps as much as 200 to 250 basis points. In total, simply because the average actively managed fund must underperform the capitalization-weighted market as a whole by the amount of financial intermediation costs that are deducted from the gross return achieved, active investing must be, and is, a loser’s game. I got these numbers by making a list of all the inflows and outflows; not just into the entire RRSP but into cash, into the investments, out of the investments, out of cash, and so on. Every transaction is a double-entry transaction, except for the final balance (outflow) and the cash inflows from my chequing account (inflow). I could have just looked at cash flows into my RRSP and the final balances but I wanted to see the breakdown between the different components. Once I had the cash flows for each individual investments I did an Internal Rate of Return for each individually. I also did an overall calculation for the entire portfolio (shown at the bottom). Considering that the EAFE index went up 23.47% last year, the S&P 500 went up 13.62%, and the TSX went up 14.51%, we didn’t do too well. All of the stuff there except for the “TD Stuff” we only owned since March when we switched to Clearsight from TD. So I lost to the the indexes I mentioned above. The reason is because we had a sizable bond portion of about 25% and we were also carrying around a lot of cash (not literally) this year for whatever reason. Well part of the reason was that Clearsight dumped my advisor after they were bought by Wellington West and I ceased communication with them after that as I switched to E*Trade. So I didn’t do any trading during that time and our cash pilled up a bit too much. The reason that my cash account went up by 6.17% annualized is because the dividends from the iShares S&P TSX 60 Index ETF (XIU) do not get reinvested (ie. it’s not a DRIP) but instead go into my cash account. So the dividends show up as sort of a capital gain in the cash account. One way for me to fix this would be to aggregate the cash inflows and outflows from cash and the iShares XIU and get the annualized return for that combination. That would give the annualized return including inflation. But once I buy another dividend-paying ETF, then what? The final 12.17% annualized return takes into account all the unrealized capital gains and dividends that went into the cash account and the dividends on the TD Canadian Bond Fund that were reinvested. I really love these calculations. It really shows how well YOU did regardless of that the mutual fund’s NAV or the ETF’s market price did. Look at the TD Canadian Bond Fund for example. My wife got 8.3% annualized on hers and I only got 4.19%. This was because I bought it at a worse time. What’s the lesson here? That you should try to time the market? NO! You can’t time the market (so give up trying). The best way in my opinion is to trade completely randomly (hard to do) or just trade at some regular interval (easy to do) regardless of what the market is doing. Too many investors panic when their investments lose value and chase performance in bull markets. These behaviours lead to lower annualized returns for your portfolio, regardless of what the underlying mutual fund or ETF’s published returns were. The results indicated that, as with most active funds, investors’ timing decisions were costly when it came to index funds. The dollar-weighted returns for virtually all large-cap index funds were worse than their official returns for the trailing 10-year period through the end of the third quarter 2005. As the table below shows, poor timing cost Vanguard 500 shareholders 2.7 percentage points of returns per year over the past decade. That’s not chump change. So I hope to see from these calculations how good/bad my timing is. By this time next year I will have an all ETF portfolio so I will be able to compare my annualized return in index X with the return of index X over the same period. I have been looking at adding an emerging markets component to my portfolio. I look at my choice as either being Vanguard’s VMO ($USD), iShares’ EEM ($USD), or a Canadian mutual fund offering (such as the TD Emerging Markets Fund or the Altamira Global Discovery Fund. Unfortunately there are no Canadian ETFs investing in emerging markets. The Vanguard Emerging Markets Fund has an MER of 0.30%. The iShares MSCI Emerging Markets Index Fund has an MER of 0.70%. Once again Vanguard seems to have the lowest-cost ETFs around. The TD Emerging Markets Fund has an MER of 2.88%, and the only thing the Altamira Global Discovery Fund is discovering is how to take MERs to astronomical levels, with an MER of 3.42%. Looks like the Altamira fund is beating the MSCI Emerging Markets Index (CAD$) but those gains are paying for the MER and it ends up just matching the index. I decided that between the Vanguard VWO and the iShares EEM I would rather go with VMO as the MER is smaller. They hold virtually the same indexes underneath. The VMO one is a “Select” MCSI Emerging Makrts index that was designed especially for Vanguard a long time ago for one of their mutual funds. VMO also has more stocks. It’s daily volume is less than EEM but still high at 400k on average which is what EEM was at a few years ago. The next thing I was worrying about was the foreign exchange. I have CAD dollars sitting in my E*Trade RRSP. If I buy VMO, E*Trade will convert the CAD to USD and purchase VMO. When I sell VMO (eventually) E*Trade will sell the VMO and covert the USD to CAD. So my CAD dollars gets converted into USD once at a rate of say 1.18 dollars CAD for every dollar USD. Then when I sell VMO they will only give me something like 1.14 dollars CAD for every dollar USD. I don’t know what E*Trade’s spread usually is (if anyone knows, please tell me) but I assume it will be 4-5%. So it looks like it falls off pretty rapidly. Gets down close to 0.5% MER which is not bad. Essentially you can just think of the the foreign exchange hit as multiplying the PV by some number, so it lowers your PV. Over time the effect of lower PV is lessened as the investment grows due to compounding. Note also that I neglected commissions in the above analysis. Keep in mind that with EEM this graph would be shifted upwards a bit. Since I have beaten the two mutual funds above by a long shot as far as cost goes, I think I might by some shares of VMO. I’ll make it about 5% of our portfolio and then I’ll make an effort to hold it for at least 10 years, where that curve really starts to flatten out. the S&P 500 Equal Weight Index is an alternative. But as I have shown in Figure 1 through Figure 4, the S&P 500 Equal Weight Index behaves more like value and mid to small-cap indexes . . . Thus, if one wants to get the exposure to the factors that influence the S&P 500 Equal Weight Index, then they probably could combine a group of passive market capitalization-weighted indexes to produce a similar pattern of returns. Given the cost of replicating an equal weighted index (brokerage costs associated with periodic rebalancing), it would seem investors could do better over the long term by using a combination of lower cost, lower maintenance, market capitalization weighted index funds as opposed to an equally-weighted index fund to gain the portfolio sensitivities desired. He is correct in that there are higher costs associated with an equal weight index. The rebalancing bonus is small but it might cancel out or even trump the effect of the slightly larger MER on the ETF that matches the S&P 500 Equal-Weight Index, the Rydex S&P Equal Weight ETF (RSP). For those who don’t already know, I am not a fan of market-cap-weighted indexes like all the S&P Canadian indexes and the US S&P 500. In the US S&P has the S&P Equal-Weight Index and there is an ETF that tracks it, the Rydex S&P Equal Weight ETF. In Canada there is no such index provided by S&P and no ETF. I knew that there was no Canadian ETF in existence that was equal-weighted but I thought that there must be at some theory, data-mining, or an informal index out there. 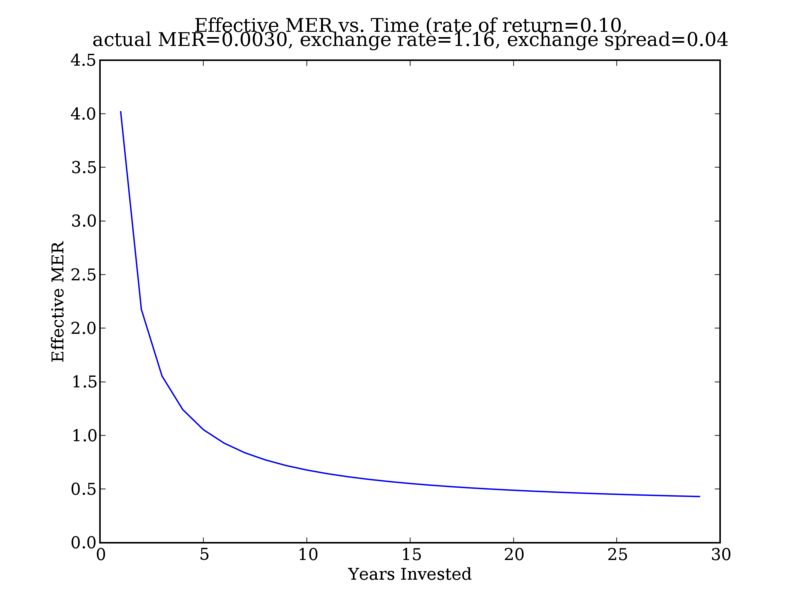 The “Mercer Median” is the median performance of a whole bunch of mutual funds, from the “Mercer Institutional Pooled Funds report.” They also note that “the EWI is a price index and does not include dividends which would add at least another 1-1.5% to total returns.” The results are even more impressive if you take into account the dividends paid. Don’t get your hopes up about buying a piece of the index from Shaunessey. They require a $2 million minimum to be a client. To just buy the index and not have a “fully-managed” portfolio with them, you will need to invest $6,666,666 million (0.15% as percent of assets, minimum fee is $10,000). More evidence that the more money one has, the more access one has to better investment advice and services. It is possible to create your own S&P TSX 60 Equal-Weighted Index (EWI), however, paying $50 commission for each stock would become prohibitively expensive. To keep your commissions to 1% of your initial purchase you would need $300,000 total assets. And rebalancing every quarter would also become very expensive. Another way to have an approximation to Shaunessey’s index would be to buy certain amounts of sector ETFs and rebalance the allocation of each ETF regularly; however, within each sector ETF the stocks would still be market-cap-weighted. The best way I can think of to create your own S&P TSX 60 EWI is to use Shareowner . It looks like you could buy 60 stocks for $36 using Shareowner and have your dividends reinvested for free. Four new ETFs were announced by Barclays Canada a couple of weeks ago. XMA and XTR provide sector exposure: Providing investors with exposure to the Canadian materials sector, XMA will replicate, to the extent possible, the performance of the S&P/TSX Capped Materials Index. XTR is designed to provide investors with exposure to the Canadian income trusts sector by replicating, to the extent possible, the performance of the S&P/TSX Income Trust Index. XMA and XTR will join Barclays Canada’s other sector iUnits funds, including energy (TSX:XEG), financials (TSX:XFN), gold (TSX:XGD), technology (TSX:XIT) and REITS (TSX:XRE) to provide investors with the ability to target investments in some of the largest and most popular Canadian equity sectors / segments. XDV provides yield opportunities: Designed to provide investors with exposure to higher yielding, dividend paying Canadian stocks, XDV will replicate, to the extent possible, the performance of the Dow Jones Canada Select Dividend Index. XDV will focus on investing in stocks with higher yields, proven dividend growth and dividend sustainability and higher liquidity. XRB provides inflation protection: To provide fixed income investors with an inflation-protected investment, XRB is designed to replicate, to the extent possible, the performance of the Scotia Capital Real Return Bond Index. I am personally going to be staying away from the income trust fund (I don’t know enough about the quality of the trusts in the S&P/TSX Income Trust Index). one component is capped at 10%. If the share price of one of the companies in the index climbs sharply, the Rydex fund pares it down to a 0.2% weighting when the portfolio is rebalanced every quarter. If a stock tumbles, more is added. Thus the fund is continuously funneling profits from stronger to weaker issues; in effect, selling high and buying low. “This is a poor man’s value tilt,” says Robert Deere, head of domestic equities for Dimensional Fund Advisors, the foremost operator of customized index funds for institutions. DFA heavily favors small and downtrodden stocks, citing academic research that shows they outperform big-cap growth stocks over long periods. Since this fund does that implicitly, “I would expect it to give you a higher return — no doubt about it,” he says. Rydex says that the equal-weighted index has greatly outperformed the market-weighted index over the last 10 years, delivering annualized returns of 14%, compared with 12% for the index. However, this document on S&P’s website puts the 10-year annualized returns at 12% and 9.3% respectively. I will definitely be buying RSP over SPY and not because I am chasing after good past returns but because the methodology makes sense.